A Lake Baikal Cocktail of Adventure. Arrival to Irkutsk. Transfer to the town of Sludyanka (110km). The town is situated on the south-western tip of lake Baikal. We’ll make a stop on the Koultuk hill at the fish market. Here you’ll have a picturesque view of the lake and surrounding mountains. Transfer to Mr Zhigalov’s museum and guest house. The Zhigalov’s family is very famous in Sludyanka and all over Russia as well as their mineralogical museum, where over 10000 samples from all over the world are presented. After dinner you will hear a story about the history of the museum and the life of stones by Valeri Zhigalov of his wife Luba. Breakfast. The next two days we go horse back riding through siberian taiga forest and get aquainted with some of Buryat traditions. Packing up to travel to the Tounka National Park, situated on the territory of the Republic of Buryatia. On the way you will make stops by sacred places, both shamanistic and buddhists. Arrival to Zoun – Mourino settlement. The guide is waiting for us by the bridge across the Zoun – Mourino river. The name of the river means “100 Horses”. Short hike over a hill to the Margasan river. On top of the hill there is a place where locals make offerings to the spirits of mountains and forests. We make a short ritual. 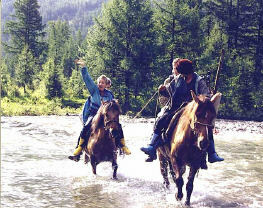 Then we mount horses and cross the river and ride to “Margasan” farm. Here we have a very simple countryside lunch. Then we make another short offering ritual to please local spirits for good journey. The first part of horse back-riding goes to the place called the “Goat’s Neck”. Here the rivers Zoun – Murino and Margasan come close together and separate again. After a short rest we continue riding down to Khalun Nugan Forest (“Birch Tree Forest”) where we stay overnight in tents or in hunters’ hut. Dinner by the fire. Breakfast. Returning back to the farm. Departure to Arshan resort. Arshan, if translated from the Buryat language means “healing water”. Accommodation in a guest house. Lunch. Walk to mineral springs, waterfall of the Kingarga (“Drum”) river, visiting local buddhist temple – Datsan. Dinner. Breakfast. Time at leisure. You may enjoing views of visit the souvenire market. Lunch. Departure the beginning of our white water rafting adventures on the Irkut River. Preparation for rafting, safety instructions. First part of rafting lasts for 4hrs. We enter the Zyrkazun canyon and overcome “The Koulitch Rapid” (2nd grade), then we pass “the Maly Rapids”. Stop at the beach on the left bank. Setting up tents. Dinner. After breakfast we start the second rather tense part of rafting. At the beginning of this length the river doesn’t have steep turns and in high waters allow to relax on your vesseles. After 4-5km we have to overcome the most serious obsticle of the route – “The Big Rapid” (2nd grade). We can hear its its roaring in a distance. The mighty stream of water breaks through the rocks swinging and jumping down. On the left bank there is a good spot for taking pictures of the rapids. Now we have to stop for rest and lunch. The continue rating we follow the river’s left turn. In about one hour we go through a cascade of rapids and can relax until the next rapid called “The Bull”. After this last for the obstacle we stop for the night at the mouth of Zazara river. Setting up tents. Dinner. Breakfast. Rafting down to the deserted village of Viguzovo, go through a canyon. Soon we approach rapids “Motsky” and “The Dog’s Rapid”. After them on the smooth waters we come down to Shamanka village with a view of Shamansky Cliff. Lunch on the right bank. Packing up the gear. Transfer to Irkutsk (50km). Price includes: all the transfers, 3 overnights in Sludyanka on FB basis (facilities outside), horseback-riding tour on FB basis, 2 overnights in Arshan on FB basis (facilities outside), rafting down the Irkut river on FB basis, rent of equipment, guides service, insurance.